Anderson Development Company (ADC), a wholly-owned subsidiary of Mitsui Chemicals, is an award-winning, innovative specialty chemical manufacturer. We’re committed to providing value-added solutions by working closely with our customers to solve their toughest problems. Many people may not have heard our name, but it is certain that our chemistry has improved their lives, whether by protecting their car, enabling their computer or cellphone’s processing, protecting their food or helping companies produce more durable industrial goods. Since our founding in 1967, we have been moving forward aggressively on many fronts to capitalize on solid growth opportunities, to expand our global presence and to sharpen our product offerings. Through our own extensive research, development and manufacturing capabilities , we are able to offer innovative specialty and custom chemicals which help improve the quality of life for our customers while typically reducing the impact to our environment. To show this commitment to sustainability, Anderson Development Company supports the American Chemical Council’s Responsible Care ® program , the chemical industry’s initiative to continually improve health, safety, security, and environmental performance worldwide. The key to our success has always been our people who strive to meet and exceed our customer’s expectations. The strong team of dedicated professionals at Anderson Development Company does more than just make products; they provide solutions for our customers. For almost 50 years, Anderson Development Company’s dedication to excellence has created long-term relationships with a wide range of companies — from smaller domestic firms to large global Fortune 100 companies. 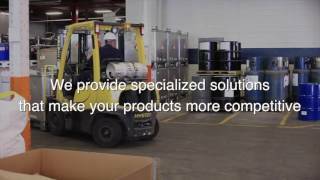 From our headquarters, manufacturing facilities, laboratories, pilot plant, warehousing and bulk storage facilities in Adrian, Michigan, Anderson Development Company is positioned to develop and provide innovative solutions to even your most complex problems. Almatex® Coating resins protect the aluminum wheels on your car (the system drastically lowers the CO2 and VOC emission footprint for protecting them as compared to liquid coatings). Almabor ® Organoboron reagents for semiconductor and pharmaceutical manufacturing. Ink binders used for flexible packaging inks (the inks used on bread wrappers or potato chip bags). Responsible Care®, Community engagement, First Responder partnership®, STEM outreach, Lenawee County Chemistry Teacher Network, Payback for Education, and many more. Yes, tours are available if set up in advance.